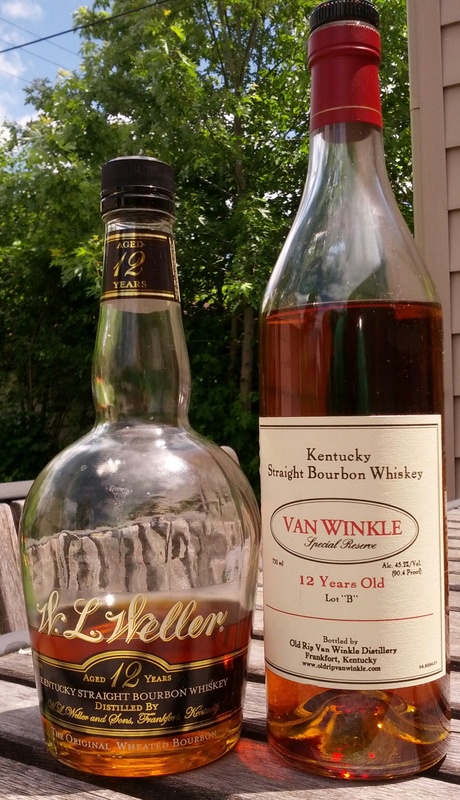 VWB: Van Winkle, Frankfort, Kentucky, USA (A joint venture between Sazerac and the Van Winkle family). W12: Alcohol, homemade bread, leather, vanilla extract, cut grass. VWB: Alcohol, leather, vanilla extract, grilled sweet corn, basil. W12: Full bodied and round. Vanilla butter cream icing, oak, alcohol. VWB: Medium bodied and soft. Oak, a hint of vanilla, sweet cornbread. W12: Cherry walnut bread, oak, alcohol. Lingers for a long time. VWB: Fairly hot, but very well balanced and more subtle than the Weller. Oak, vanilla icing, alcohol. Also linger long, getting sweeter and fruitier as time goes on. Parting words: This head to head was inspired by a forum thread inspired by a long running discussion in bourbon circles regarding the Van Winkle line of wheated bourbons and the Weller line. Are they the same whiskey in different bottles? Is Weller just a dumping ground for Van Winkle rejects? Is Weller 12 “basically Pappy” as one store owner told a bourbon lover recently? These two expressions are the best two to compare the differences because they’re the same age and virtually the same proof. Both are made using the same mashbill, same yeast, same distillery and aged in the same warehouses. They are also most likely put into barrels with the same char level at the same proof. So all the pre-aging variables are the same. The difference is in barrel selection and it does make a difference. Not a huge one but it’s there. Both have the same mix of aromas and flavors, but in different proportions. Weller 12 has a little bit of an unrefined grassy bite to it but it is only noticeable to me when doing the head to head with Lot “B”. Lot “B” is more elegant and seems to have more depth. The herbal note is there but it takes the form of a subtle Basil aroma. Perhaps the areas of the warehouses in Frankfort reserved for Van Winkle are less prone to developing the earthy, grassy aromas in bourbons aged there or perhaps there’s a higher proportion of older bourbon in the mix. So, what’s the verdict? Lot “B” is the superior bourbon, but only by a little. Weller 12 is a much better bargain than its Van Winkle cousin. Lot “B” is not more than twice as good as Weller 12 but Weller 12 is probably underpriced, so it evens out in my mind. Both Weller 12 and Van Winkle Lot “B” are recommended. I definitely agree with you on the quality of Weller 12 yr., but I have found that this whiskey doesn’t hold all that well in the bottle. The first five or six glasses poured were wonderful, but it got pretty tannic once it was about halfway down the bottle. Did you find that the Weller 12 yr. changed at all over the course of time? That’s interesting. Mine had been opened for a long time and tasted OK, maybe better than when I first opened it. I have noticed a lot of batch variation. Maybe that’s what’s going on. Awesome. Maybe I snagged an off-batch or did not store it correctly. It sounds like it is definitely worth snagging another bottle of the Weller 12. It has been a solid two years since I dipped into one. Ha! Well, add that to the very short list of things we don’t agree on. I have noticed a lot of batch variation in Weller 12s so there is that. Any tips on where to find W12? I’m a fellow Metro Detroiter, feel like I’ve checked everywhere! Unfortunately no! I don’t think I’ve ever seen a Weller 12 on a Michigan shelf.